Dramatic mountain views. A warm fire. Cleverly crafted cocktails. Fine dining without the fuss. 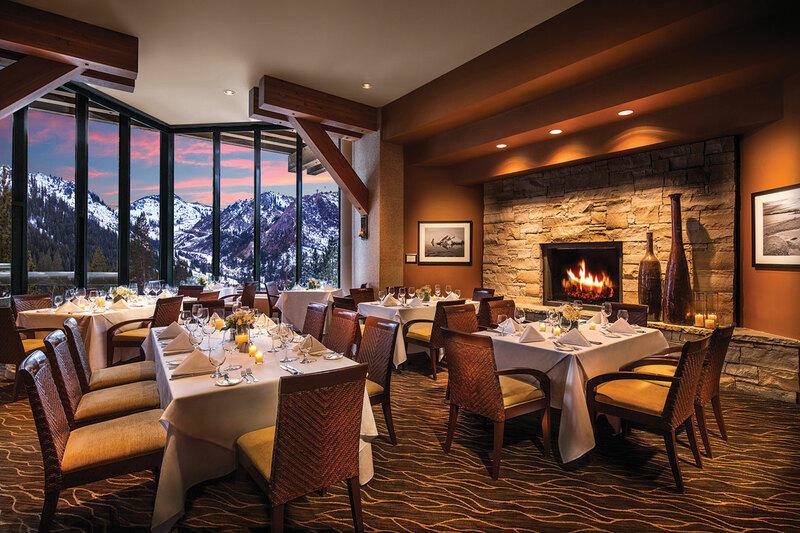 Six Peaks Grille, the Resort at Squaw Creek’s signature slopeside restaurant, is all that. 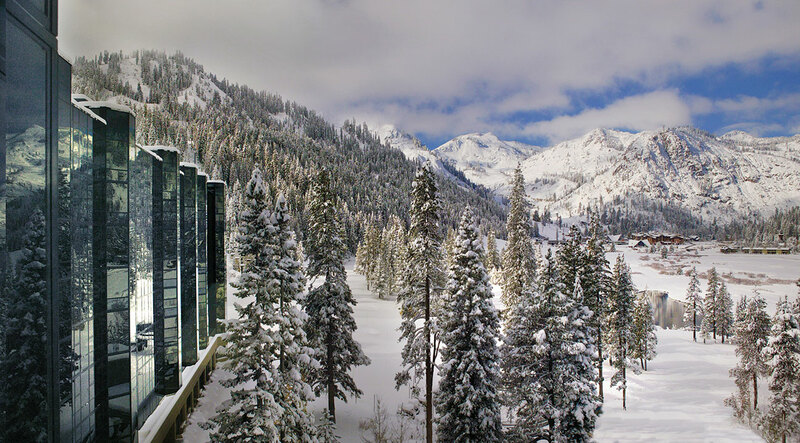 Named for the storied Squaw Valley summits framed in the dining room’s floor-to-ceiling windows, the 104-seat restaurant has occupied this High Sierra spot for over a decade, replacing the former Glissandi in 2004 when Destination Hotels took over management of the luxury ski-in, ski-out Olympic Valley property. An earth-tone palette, granite hearth and sleek bar lend a quietly elegant contemporary mountain ambiance; the linen-topped tables are naturally oriented toward the spectacular scenery. Just outside, the stone patio—overlooking the expansive resort’s cascading waterfall, meandering swimming pools and meadow beyond—is open year-round. With winter’s earlier sunsets, diners can soak in the twilight’s alpenglow—perchance by the patio fire pit—while sipping on a scratch seasonal cocktail such as the White Winter Bubbly: Prosecco flavored with a simple syrup infused with pine needles picked outside the door. The barbecue lemonade employs bourbon-marinated, grilled and hand-pressed lemons and house-made rosemary honey simple syrup. Grilled jalapeños and peaches, muddled with Don Julio añejo tequila, fresh lime and agave nectar make for a mighty fine margarita. “Hoptails” include the Beerita—a blend of Corona, Cazadores tequila, watermelon and lime. The wine list proffers nearly 20 pours by the glass. With lingering light and drink in hand, start with a selection of cheese and charcuterie assembled from the list of Northern California suppliers. Pick perhaps a Point Reyes Farmstead Bay Blue, the Lamb Chopper sheep milk hard cheese from Cypress Grove in Arcata, or Foggy Morning organic creamy cow milk from the Nicasio Valley Cheese Company. Cured meats range from bresola, prosciutto, soppressata and country pâté to rabbit sausage from the Sausage Factory in Carson City. Breads are baked in-house daily and arrive with butter sprinkled with black sea salt. Then it’s time to get down to the focused and seasonal New American menu, courtesy of chef de cuisine Charlie Trexel, who collaborates and consults with the resort’s executive chef Jason Friendy on the culinary lineup. Born and bred in New England, at 26 years of age Trexel has already logged 14 years in the kitchen, including a stint as executive sous chef at the Forbes Travel Guide 5-star rated TÈ in Leola, Pennsylvania, near Lancaster. A popular starter is the perfectly seared sea scallops served atop a smooth cauliflower cream, with carrot reduction and brown butter. Customers also crave the coffee-crusted duck with huckleberry, apple, cocoa nibs, pistachio and a Dr. Pepper reduction. Foie gras in all its culinary controversy comes with maple balsamic glaze, orange zest, crushed macadamia nuts, toasted brioche and rum butter. The chilled beet salad is another perennial favorite, layered with goat cheese, arugula, tossed with a stone ground vinaigrette and topped with crispy shallots. The Bloomsdale spinach salad blends macerated apricots, frisée, peppered mascarpone, sour cherry marmalade and a honey lemon emulsion. 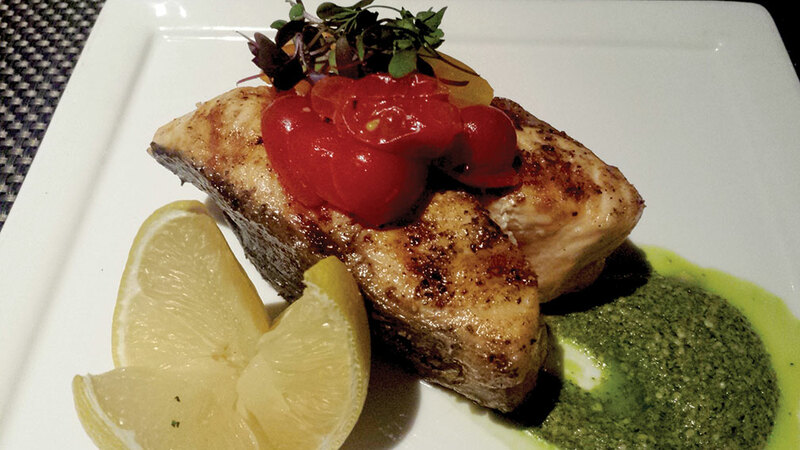 Six Peaks sources seasonal sustainable seafood, meats and produce locally and regionally whenever possible. Come summer, it leans heavily on an on-site chef’s garden. Trexel’s grill, fueled with apple and pecan wood, is the workhorse of the kitchen. It’s used to fire the tender filet mignon finished with oven-dried tomato, roasted garlic, thyme and port reduction as well as the 21-day aged 14-ounce rib eye with caramelized cipollini jus and heritage pork chop with cherry bourbon glaze. Other entrées also benefit from the fire: Chicken involtini wrapped in pancetta, stuffed with Fontina cheese and garden sage that’s finished with a peppered anisette glaze, as well as a wild king salmon steak served atop a carrot top pistou. Those looking for something lighter can opt for the wild-caught Pacific shrimp served with fried lemon polenta squares, pickled watermelon and avocado crema. As the colder weather sets in, look for more soups and heartier salad options, the addition of game like lamb loin and wild boar belly, perhaps an Arctic char and Maryland blue crab cakes, according to Trexel, whom diners can watch in action by booking the chef’s table in the kitchen. Entrées are served à la carte, but sides like wood-grilled asparagus, forest mushrooms sautéed in butter, white wine and shallots and truffle potato mousseline (fancy word for creamy mashed potatoes) are easily shared. Speaking of sharing—a skill impressed upon us since preschool—the dessert menu will make that hard. Commit the low carb diet to the deep and opt for your own chocolate lava cake with fresh berries, vanilla ice cream and port reduction or the house-made donut holes dusted with cinnamon sugar served with bourbon caramel, chocolate and berry dipping sauces for dunking. It’s winter and we are in the mountains, so a warm drink might be in order. Try the tiramisu coffee with Black Beard spiced rum, Godiva Liqueur, Bailey’s Irish Cream or an adult hot chocolate like the Almond Joy laced with Amaretto, Malibu Rum and, of course, whipped cream. For something truly different though, opt for an after-dinner absinthe, also known as “the green fairy.” Immortalized in nineteenth century bohemian France—and oft banned for its purported hallucinogenic properties—the anise-flavored spirit distilled from the wormwood plant and a range of herbs has made a comeback of late and here it is presented with the ritual of “la louche”: The emerald liquid is poured over a flaming lump of sugar in a sieve atop a glass, followed by a trickle of iced water from an elevated dispenser, releasing the absinthe’s essential oils and transforming its clear green color to the fabled milky opalescence. Swirl the glass and sip and appreciate—through no stretch of an altered imagination—that Six Peaks Grille is a restaurant in a hotel, rather than a hotel restaurant. We’ll drink to that. Susan D. Rock likes to linger longer over a meal while her husband and two sons tear up the slopes.